For high speed and high performance PCR. Manufactured and quality-controlled at New England Biolabs, Thermo Scientific® Phusion® High-Fidelity DNA Polymerase offers both high fidelity and robust performance. High-Fidelity DNA Polymerases are important for applications in which the DNA sequence needs to be correct after amplification. 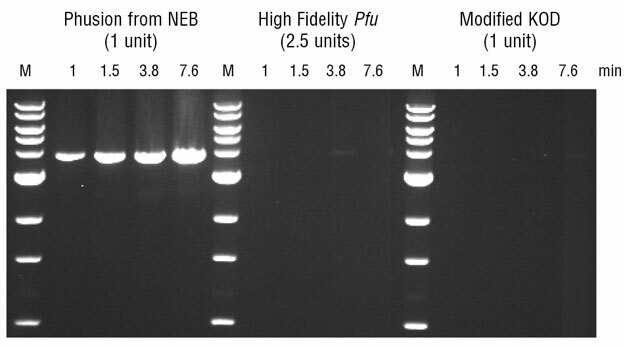 Phusion High-Fidelity DNA Polymerase offers both high fidelity and robust performance, and thus can be used for all PCR applications. Its unique structure, a novel Pyrococcus-like enzyme fused with a processivity-enhancing domain, increases fidelity and speed. Phusion DNA Polymerase is an ideal choice for cloning and can be used for long or difficult amplicons. With an error rate >50-fold lower than that of Taq DNA Polymerase and 6-fold lower than that of Pyrococcus furiosus DNA Polymerase (1), Phusion is one of the most accurate thermostable polymerase available. Phusion DNA Polymerase possesses 5´→ 3´ polymerase activity, 3´→ 5´ exonuclease activity and will generate blunt-ended products. Phusion High-Fidelity PCR Master Mix with HF Buffer is a 2X master mix consisting of Phusion DNA Polymerase, deoxynucleotides and reaction buffer that has been optimized and includes MgCl2. All that is required is the addition of template, primers and water. Fidelity assays were performed using a lacI-based method modified from Frey & Suppman, 1995. 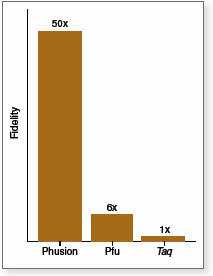 High Yield - Increased product yield using minimal amount of enzyme. Versatile - Can be used for routine per as well as long or difficult templates. 25 mM TAPS-HCl (pH 9.3 @ 25°C), 50 mM KCl, 2 mM MgCl2 , 1 mM β-mercaptoethanol, 200 µM dNTPs including [3H]-dTTP and 15 nM primed M13 DNA. Products specifications for individual components in the Phusion High-Fidelity PCR Master Mix with HF Buffer are available separately. What are the advantages to using Phusion® High-Fidelity PCR Master Mixes? Does Phusion® High-Fidelity DNA Polymerase exhibit a strand displacement activity? Will Phusion® High-Fidelity DNA Polymerase incorporate dUTPs? Are the DNA fragments produced by Phusion® High-Fidelity DNA Polymerase blunt-ended or do they have the single-base 3´ overhang that Taq DNA Polymerase yields? I'd like to clone a fragment amplified with Phusion® High-Fidelity DNA Polymerase. Do I have to blunt-end clone? The purchase price of this product includes a limited, non-transferable license under U.S. and foreign patents owned by BIO-RAD Laboratories, Inc., to use this product. No other license under these patents is conveyed expressly or by implication by purchase of this product.